Over the last two decades, we have seen a dramatic spike in young people taking psychiatric medication. As new drugs have come on the market and diagnoses have proliferated, prescriptions have increased many times over. The issue has sparked heated debates, with most arguments breaking down into predictable pro-med advocacy or anti-med jeremiads. Yet, we’ve heard little from the “medicated kids” themselves. 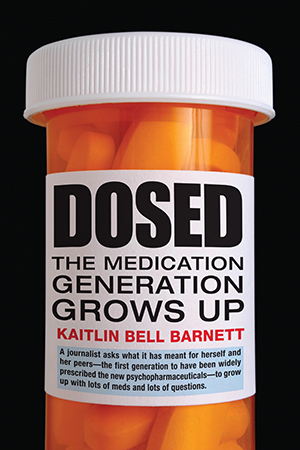 In Dosed, Kaitlin Bell Barnett, who began taking antidepressants as a teenager, takes a nuanced look at the issue as she weaves together stories from members of this “medication generation,” exploring how drugs informed their experiences at home, in school, and with the mental health professions. For many, taking meds has proved more complicated than merely popping a pill. The questions we all ask growing up-“Who am I?” and “What can I achieve?“-take on extra layers of complexity for kids who spend their formative years on medication. As Barnett shows, parents’ fears that “labeling” kids will hurt their self-esteem means that many young children don’t understand why they take pills at all, or what the drugs are supposed to accomplish. Teens must try to figure out whether intense emotions and risk-taking behaviors fall within the spectrum of normal adolescent angst, or whether they represent new symptoms or drug side effects. Young adults negotiate schoolwork, relationships, and the workplace, while struggling to find the right medication, dealing with breakdowns and relapses, and trying to decide whether they still need pharmaceutical treatment at all. And for some young people, what seemed like a quick fix turns into a saga of different diagnoses, symptoms, and a changing cocktail of medications. The results of what one psychopharmacologist describes as a “giant, uncontrolled experiment” are just starting to trickle in. Barnett shows that a lack of ready answers and guidance has often proven extremely difficult for these young people as they transition from childhood to adolescence and now to adulthood. With its in-depth accounts of individual experiences combined with sociological and scientific context, Dosed provides a much-needed road map for patients, friends, parents, and those in the helping professions trying to navigate the complicated terrain of growing up on meds. I fall hard for coming-of-age stories, and my list of favorite books and movies contains many in this genre, from Pride and Prejudice to The Catcher in the Rye. The movie Garden State, which starred Zach Braff and Natalie Portman, also struck a chord with me when it came out in 2004. It dramatizes a few days in the life of Andrew Largeman, a twenty-six-year-old struggling actor in Los Angeles who returns to his native New Jersey for his mother’s funeral. Andrew is nothing if not alienated: he feels disconnected from celebrity-studded Hollywood as well as from his old hometown, which he hasn’t visited since leaving for boarding school nearly a decade earlier. For the first time in sixteen years, Andrew has stopped taking the psychotropic medications his psychiatrist father prescribed after ten-year-old Andrew caused an accident that rendered his mother a paraplegic. Like the illegal drugs his high school buddies take, Andrew’s meds serve as a metaphor for the feelings of inadequacy, disappointment, and rootlessness endemic to my generation of twenty-somethings. Judging from the film’s cult-hit success, its target audience of my peers apparently found the metaphor apt. When Andrew falls in love with a quirky, vibrant girl he meets in a doctor’s waiting room, she shows him how to reengage with his feelings--and the world. Presumably, he leaves the medications behind. For several years, Garden State remained my favorite movie about my generation. It spoke to me as a young person growing up in turn-ofthe-millennium America--though not as a young medicated person. In fact, I completely forgot psychiatric drugs were even mentioned. Funny, because I myself have been taking medication since high school, and Garden State is one of just a couple of films I know of to allude to the psychological impact of growing up taking psychotropic drugs. But although it touches on this important phenomenon, the film never really examines its underlying assumptions that medications numbed Andrew’s pain and guilt, and that getting off them allows him once again to experience the agony and ecstasy of life. For the first time in history, millions of young Americans are in a position not unlike Andrew’s: they have grown up taking psychotropic medications that have shaped their experiences and relationships, their emotions and personalities, and, perhaps most fundamentally, their very sense of themselves. In Listening to Prozac, psychiatrist Peter Kramer’s best-selling meditation on the drug’s wide-ranging impact on personality, Kramer said that “medication rewrites history.” He was referring to the way people interpret their personal histories once they have begun medication; what they thought was set in stone was now open to reevaluation. What, then, is medication’s effect on young people, for whom there is much less history to rewrite? Kramer published his book in 1993, at a time of feverish--and, I think, somewhat excessive--excitement about Prozac and the other selective serotonin reuptake inhibitor antidepressants, or SSRIs, that quickly followed on its heels and were heralded as revolutionary treatments for a variety of psychiatric problems. For most people, I suspect, medications are perhaps less like a total rewriting of the past than a palimpsest. They reshape some of one’s interpretations about oneself and one’s life but allow traces of experience and markers of identity to remain. The earlier in life the drugs are begun, the fewer and fainter those traces and markers are likely to be. All told, the psychopharmacological revolution of the last quarter century has had a vast impact on the lives and outlook of my generation--the first generation to grow up taking psychotropic medications. It is therefore vital for us to look at how medication has changed what it feels like to grow up and to become an adult. Our society is not used to thinking about the fact that so many young people have already spent their formative years on pharmaceutical treatment for mental illness. Rather, we focus on the here-and-now, wringing our hands about “overmedicated kids.” We debate whether doctors, parents, and teachers rely too heavily on meds to pacify or normalize or manage the ordinary trials of childhood and adolescence. Often, the debate has a socioeconomic dimension that attributes overmedication either to the striving middle and upper-middle classes, or to the social mechanisms used to control poor children and foster children. We question the effectiveness and safety of treating our youth with these drugs, most of which have not been tested extensively in children and are not government-approved for people under eighteen. We worry about what the drugs will do to developing brains and bodies, both in the short and long term. The omnipresent subtext to all this: what does the widespread “drugging” of minors say about our society and our values? Certainly, these questions are worth debating--even agonizing over. But they ought not to constitute the be-all and end-all of our society’s conversation about young people and psychiatric drugs, particularly with millions of medicated teens transitioning into adulthood. Too much of the discussion occurs in the abstract, and drugs too easily become a metaphor, as in Garden State, for a variety of modern society’s perceived ills: the fast pace of life and the breakdown of close social and family ties; a heavy emphasis on particular kinds of academic and professional achievement; a growing intolerance and impatience with discomfort of any sort. Far too rarely, though, do we consult young people themselves. How do they feel about taking medication? How do they think it has shaped their attitudes, their sense of themselves, their academic and career paths, their lives? How do they envision medication affecting their futures Focusing on people who needed therapeutic intervention early in life and who continued to use medication for an extended period of time can help us get past the are-they-or-aren’t-they nature of the “overmedicated kids” debate. By assessing what medication has actually meant for my peers, I hope to get at something more intimate and more complex than either the psychotropic true believers or the total skeptics allow themselves to consider. “A prescription becomes an event that generates fantasies, wishes, concerns, and meaning,” write the social scientists Tally Moses and Stuart Kirk in an analysis of young people’s experiences of psychotropic meds. “It structures one’s own expectations and those of others in ways that are not necessarily intended or foreseen.” As Moses and Kirk suggest, the experience of taking psychotropic drugs is more than just popping a pill, and these drugs often become a part of the self in ways children and teenagers could not have imagined when they swallowed their first dose. Now that the first generation of medicated kids is entering adulthood, we have an invaluable opportunity to hear about their experiences with psychotropic drugs, and their assessment of those experiences. In addition to looking at the family, medical, and educational circumstances in which drugs are prescribed and taken, that is what this book sets out to do. My cohort lives with some powerful contradictions. On the one hand, we have grown up with the idea that prolonged sadness, attention problems, obsessions and compulsions, and even shyness are brain diseases that can--and ought--to be treated with medication, just as a bodily disease like diabetes ought to be treated with insulin. The 1990s, sometimes called “the Decade of the Brain,” encompassed a period of unprecedented growth in understanding how the brain works, which generated enormous enthusiasm about the prospects for discovering the underlying mechanisms behind mental illness, enthusiasm that many say was overwrought and premature. Direct-to-consumer pharmaceutical advertising on TV, which the U.S. Food and Drug Administration authorized in 1997, has allowed drug companies to define the public’s understanding of mental illness and psychiatric medications--and this is especially true, I think, for young people who knew no other paradigm. Even as we grew up, though, immersed in the idea of an “imbalance” of particular brain chemicals--an outdated theory that has not held up to the science--we have inherited the American ideal of self-sufficiency, of solving one’s problems through one’s own resourcefulness. As we’ve sought to forge our identities, we have often struggled to reconcile the two.